VANCOUVER, B.C. -- Daniel Sedin continues to remain humble even in the face of great adulation. He already earned an invitation to the 2011 NHL Awards on June 22 in Las Vegas because he won the Art Ross Trophy as the League's regular-season scoring leader, but Sedin also will be trying to pick up an even greater prize in Sin City. The NHL announced Thursday that Sedin, along with Anaheim's Corey Perry and Tampa Bay's Martin St. Louis, are the three finalists for the Hart Trophy, which goes to the regular season MVP as voted on by the Professional Hockey Writers' Association. Sedin finished the season with 104 points, helping the Canucks win the Presidents' Trophy with 117 points. He chatted for a few minutes with NHL.com and NHL Network to discuss what winning the Hart Trophy would mean to him. Q: What allowed your game to rise to the level that it did this season? Sedin: I think watching Henrik last year, he carried this team for the most part of the year and played without me for 20 games, too. That was the one thing that took us to another level, watching him play without me and him being able to play without me. I think that gave us a lot of confidence. Q: Is there some brotherly competition here? Henrik won the Hart and now you want to tie him up in that category? 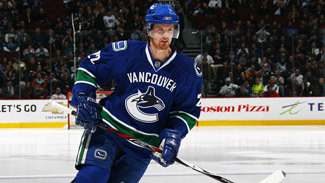 Sedin: People think that, but for us, on the ice we don't compare. We like to help each other out. I don't think that has any part of this. Q: What would it mean for you guys to be the first-ever brothers to do this in back-to-back years? Sedin: It would be neat, of course. It was a great honor for him last year and we'll see what happens this year. But to be nominated is a great honor. Q: When you were growing up, was becoming an MVP in the National Hockey League ever one of your goals? Sedin: Not really. Growing up it was mostly playing for our own Cup (in Sweden). When we came over here we had some tough years in the beginning. For us, after those few years, we just wanted to become good players, take it year by year. That's what we've been doing. Q: By getting this nomination, people are saying the Canucks had a great year but they wouldn't have been able to do it without you. What does that mean to you? Sedin: It means a lot. You're working to be a part of the team, so that is a great honor. To be successful as an individual you need a good team, too. That's how I look at it. Q: OK, get selfish here, what would it mean for you to win this award? Sedin: It would mean a lot. Watching Henrik win it last year was great for me, too, and being able to be one of the three that has a chance this year is good enough. But we'll see what happens. 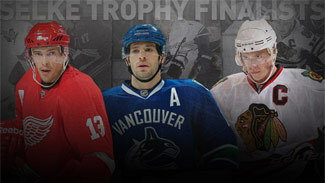 Q: Marty St. Louis is one of your competitors in this category, another finalist. Tell me about his game, why he's so good and why he's in this position. Sedin: I was talking to Mattias Ohlund because he plays with him now, and he says he has such a great work ethic and some great skills. I don't watch him a whole lot, but I know his offense and he brings a lot to that team. Q: One of the guys you do see a lot is Corey Perry in Anaheim. When you do get a chance to play against him or when you get a chance to watch him because you're in the same time zone, what do you think about? What do you get amazed at? Sedin: I think he's the best one-on-one player in the League. He's great around the net. He has a long stick. He's strong and that's what makes him so good. He's really good in front of the net on the power play, too. He brings a lot to the table. Q: One final one here for you -- you just finished this grueling rollercoaster of a series against the Blackhawks and now you have to flip the switch and play Nashville. How can you do that considering the Predators are such a different team than the Blackhawks? Sedin: Yeah, the Blackhawks have a lot of individual good players and you have to be careful every shift you're out there. I like the depth on our team, but I think they have a deep lineup, too. That was a tough series. We didn't want it to go seven games but it did. But we stuck with our game plan and it worked out well. It'll be the same against Nashville. They have a solid four lines and every line on our team has to be solid and make sure we win the battles.